Iraqis are electing new provincial councils in the first nationwide vote in four years, with the Sunni minority expected to turn out in strength. Sunnis largely boycotted the last ballot. Correspondents in Baghdad, where there has been a total ban on vehicles, said voting started slowly. 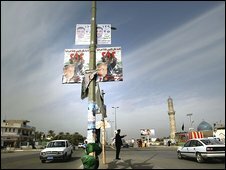 The vote is seen as a test of Iraq’s stability ahead of the next general election later this year. Security is tight and thousands of observers are monitoring the polls. 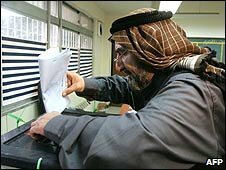 Up to 15 million Iraqis are eligible to cast votes. “This is a great chance for us, a great day, to be able to vote freely without any pressure or interference,” a Baghdad voter identified as Hamid told Reuters news agency. Another voter said he had not slept in order to be first at the polling station. “I want this experience to be a success, and that there will no fraud,” said Adnan al-Janabi. Voters had to pass through stringent security checks to reach the polling stations, which were mostly set up in schools. As voting got underway, several mortar rounds landed near polling stations in Tikrit, hometown of late ruler Saddam Hussein, but no casualties were reported. Hundreds of international observers are monitoring the vote, as well as thousands of local observers from the various political parties. At least eight of the 14,000 candidates have been killed in the run up to the election. Three of the candidates – all Sunni Muslims – were killed on Thursday, in Baghdad, Mosul and Diyala province. While the recent level of violence around Iraq is significantly lower than in past years, Iraq’s international borders have been shut, traffic bans are in place across Baghdad and major cities, and curfews have been introduced. Hundreds of women, including teachers and civic workers, have also been recruited to help search women voters after a rise in female suicide bombers last year, according to the Associated Press. Iraqi and US military commanders have in recent days warned that al-Qaeda poses a threat to the elections. Sunnis largely boycotted the last ballot, a general election which resulted in Shia and Kurdish parties taking control of parliament. Despite intimidation, many Sunni voters say they will vote this time. Some, like Khaled al-Azemi, said the boycott last time had been a mistake. “We lost a lot because we didn’t vote and we saw the result – sectarian violence” he told the News. The drawing of alienated Sunnis back into the political arena is one of the big changes these elections will crystallise. On the Shia side, the results will also be closely watched amid signs that many voters intend to turn away from the big religious factions and towards nationalist or secular ones. If they pass off relatively peacefully, these elections will set the stage for general polls at the end of the year and for further coalition troop withdrawals, our correspondent says. The election is also being seen as a quasi-referendum on the leadership of Prime Minister Nouri Maliki. Saturday’s elections are being held in 14 of the country’s 18 provinces, with more than 14,000 candidates competing for just 440 seats. There is no vote in the three provinces of the semi-autonomous Kurdish region of the north and the ballot has been postponed in oil-rich Kirkuk province. Iraq’s provincial councils are responsible for nominating the governors who lead the administration and oversee finance and reconstruction projects. Thai Prime Minister Samak Sundaravej has announced plans to hold a national referendum in an effort to defuse the ongoing political crisis. An exact date has not been decided, but a referendum can be held 30 days after being approved by the Senate. In an earlier radio address, Mr Samak said he would not resign or bow to the demands of protesters who have been occupying his offices since last week. A state of emergency has been in place in Bangkok since Tuesday. The anti-government protesters – from the People’s Alliance for Democracy (PAD) – say Mr Samak is merely a proxy for former Prime Minister Thaksin Shinawatra, who was ousted in a coup in 2006 and is now in exile. “I am not resigning, I will not dissolve parliament. I have to protect the democracy of this country,” Mr Samak said in his radio address on Thursday morning. He said he was a defender of democracy against a movement that threatened to bring “anarchy” to Thailand. 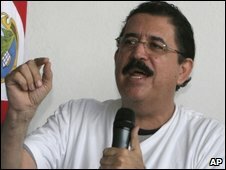 “The PAD is an illegal group who have seized the Government House and declared their victory. How can that be correct?” he said. After his address, Mr Samak summoned his cabinet for an emergency meeting, and they agreed to hold a referendum to try to resolve the crisis. A government spokesman said the referendum could take place by early October if the Senate quickly endorsed a bill to organize the vote. Culture Minister Somsak Kietsuranond said the referendum would ask a range of questions including whether the government should resign, whether it should dissolve parliament and what people think about the ongoing protests. The PAD has a passionate following in various parts of the country, especially Bangkok, and some powerful backers among the elite. But it has little support in most of rural Thailand, which voted strongly for Mr Samak, and Mr Thaksin before him. Thai society remains deeply divided over the issue. As the standoff has developed, some unions have begun supporting the protesters. However, a strike called by an umbrella group of 43 unions on Wednesday appeared to have failed – one piece of good news for the government. But the prime minister’s attempt to contain the PAD protests with a state of emergency seem to have fallen flat. 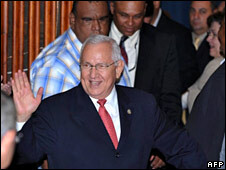 The army has refused to exercise the extra powers he gave them, arguing that the conflict is a political one that cannot be solved by military intervention.